According to Gartner, the data center no longer stands at the epicenter of the IT world. Indeed, software-defined, hybrid cloud IT has opened up a whole new realm of options for delivering and controlling applications and data. The advantages of a hybrid cloud strategy run far and wide, and any organization with more than one location should be looking for ways to extend those benefits to their remote offices. That’s where Riverbed and IBM come in: our joint solutions integrate technology that supports the delivery of dynamic hybrid IT services to global locations and enables the remote office to participate in the vast opportunities that make up the hybrid cloud ecosystem. At IBM InterConnect 2017, March 19-23 in Las Vegas, we’ll be showcasing these solutions on the show floor in booth #416. If you plan to attend, stop by our booth and take a moment to find out how Riverbed can be a compelling differentiator for your business. Not only will our full lineup of Riverbed Cloud-Ready Branch Office solutions be on display, but we’re also going to take a deep dive into use cases and best practices with ongoing presentations and solutions videos. In addition, I’ll be representing Riverbed as we team up with IBM for a breakout session on Monday, March 20 at 2:00 pm PT in Islander E room at Mandalay Bay. 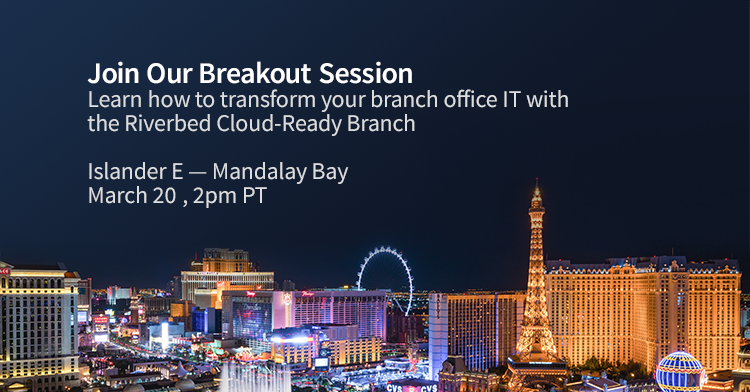 Titled ‘Enable the Cloud Ready Branch to Deliver Remote Office IT-as-a-Service,’ the session will offer a playbook for transforming distributed branch IT to a more simplified, centralized and cost-effective model. You won’t want to miss it, especially because we’re going to raffle off a Lenovo Yoga 710 laptop immediately following the presentation. As IT has transitioned to the cloud, InterConnect has evolved to become IBM’s premier conference for cloud education and skill development. Riverbed takes great pride in participating every year. Our presence is vital to our strong ties with IBM and it demonstrates our commitment to the evolution of the cloud in the global market. We continue to be inspired by the caliber of the InterConnect attendees, by the many advances and innovations on display, and by the powerful partner ecosystem that IBM brings together for this extraordinary event. What you’ll find at InterConnect is an eclectic assortment of cloud solutions, but if the remote office is where your challenges lie, then the Riverbed booth is where you’ll want to be. Together with IBM, our focus is on helping remote offices overcome the IT roadblocks they face. The reality is, while it is in branch locations that critical work gets done—and a lion’s share of business revenue is often generated—many times these locations can’t keep pace with the transformative IT advances embraced by the headquarters office. Instead, they are often hindered by aging infrastructure, inefficient operations, unreliable application performance and unsecured data. We’re excited to have our moment in the spotlight at InterConnect to explain how our Cloud-Ready Branch Office solutions can be a catalyst for change, offering the tools to connect, monitor and optimize application performance for today’s rising tide of remote offices. From SaaS applications, to packaged apps running on IaaS as well as cloud-native apps, our joint solutions with IBM simplify WAN management for branch offices. With single-click cloud deployment for seamless connectivity and performance in the cloud, they make it easy to scale out hybrid IT services to every location across the organization.